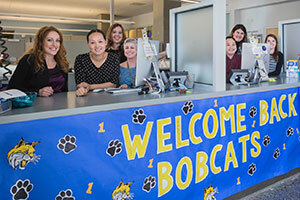 Whether staffing the front counter, answering phone calls and emails or chatting online, staff members at UC Merced’s Students First Center (SFC) pride themselves on providing excellent customer service to all undergraduate and graduate students. The Students First Center is the campus’s one-stop shop for questions regarding class registration, holds, fees and financial aid, and also serves as a referral point for other resources such as the Calvin E. Bright Success Center and Housing and Residence Life. Ryan Valencia, a senior majoring in biological sciences, said he relies on the Students First Center for information about his student loans and payment deadlines. Although Enrollment Services has moved many of its processes to online forms over the past year, Perry said the SFC has seen an increase in activity over the last few months. Since the beginning of the fall semester, the SFC experienced a 13 percent increase in traffic, assisting 6,969 students (including repeat visitors) compared to 5,619 the prior year. The center saw a 50 percent increase in services provided in August 2015 compared to August 2014. In response to this increase, the SFC is working on several improvements and enhancements it plans to roll out by the fall. Improve wait times: During peak times — like the week preceding the start of a semester — wait times in line at the SFC or on the phone can be much longer than normal. When leaving voicemails for the center, students are encouraged to leave their full names, the best numbers to reach them and their student ID numbers to facilitate a quicker response. Perry also recommends that students check online resources first, as many of their questions are answered there. Students can also find important information by logging into to the myUCMerced portal frequently. The SFC posts items that are critical to student success like dates and deadlines. Two areas students should watch closely are the personalized checklist and the “Announcements” section. Improve chat service: The center is committed to enhancing chat capabilities in order to increase the number of chat sessions that can be accommodated. Launch a queuing system: A queuing system will improve the student experience by increasing service speed and flow across all points of contact. The SFC is open from 9 a.m. to 4 p.m. Monday through Thursday and from 9 a.m. to 2 p.m. Fridays, and can be found on the first floor of the Kolligian Library. To contact the center, email studentsfirst@ucmerced.edu or call 209-228-7178. You may also chat online with a staff member from 8 a.m. to noon and 1 to 5 p.m. Monday through Thursday, and from 8 a.m. to noon, 1 to 2 p.m. and 4 to 5 p.m. on Fridays. The center values all feedback and reaches out to students who use its services twice a year to find out what can be improved. Perry uses the feedback to analyze trends and adjust staff assignments. A link to the center’s comment card is featured on the SFC website.